Suppose I’d been slogging at work a few hours, and finally this clutter begins to annoy me…. The words to James Taylor’s song “Up on the Roof” starts trickling thru my brain, slightly altered…. Aren’t Nuthatches & Chickadees just beautiful wee birds? SO enchanting! And with surprisingly strong foot grip. When they come in for a landing, I can feel their wings pushing the air around my hand. Just as their voices are different, so are their wing beats, and I with eyes closed I’d know which was landing. But…who could close eyes to such a delight as a wild bird eating out of your hand? Oh – and there is a note penned on my hand so my daughter’s know it’s not just a Google image – it’s really Mum’s hand. 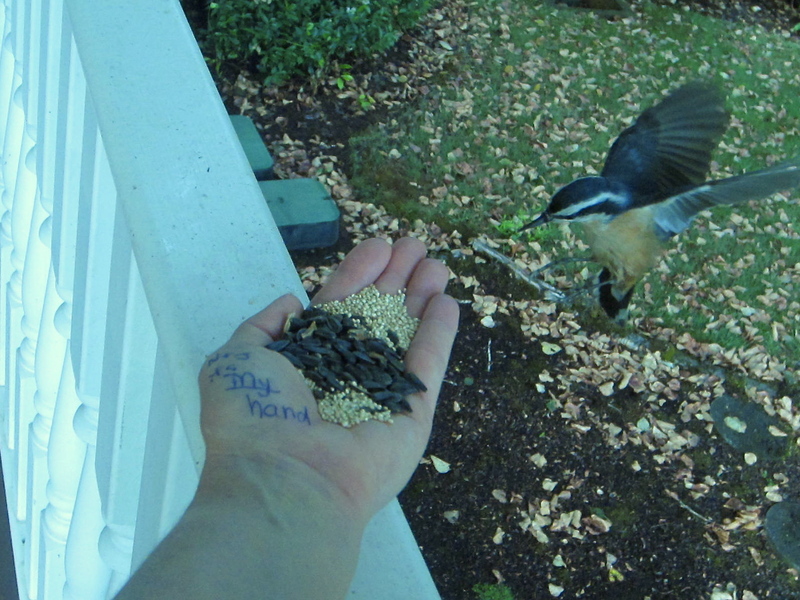 These photos are heading to St. Louis and Scotland to prove my verbal accounts of hand-feeding the birds! 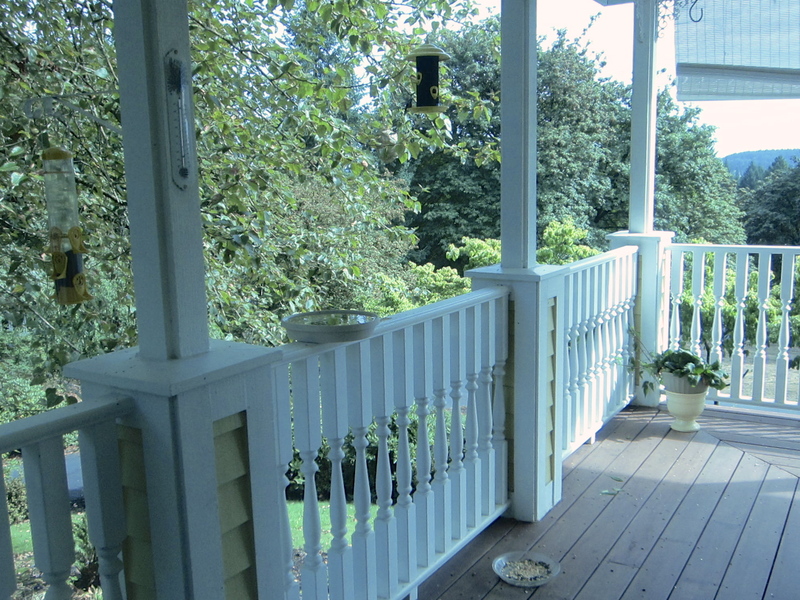 Here’s the porch as I walk out the sliding door. We have a thistle feeder for the American Goldfinches, but the black sunflower seed is by far the most popular food. We’ve tried mixed seed, but I’ve watched birds flick it aside in search of sunflower seed instead. A plant tray holds water on the railing, and the squirrel’s bowl of chow below. After a couple bird feeding breaks a day, I’m good to go back to work indoors with a happier heart and a big ol’ smile on my face! Hmmm….I’m tempted to needle felt a Nuthatch to decorate my well-known vendor hat. Wouldn’t THAT be fun?! Yeah – I gotta do it! See you all at OFFF 2013! 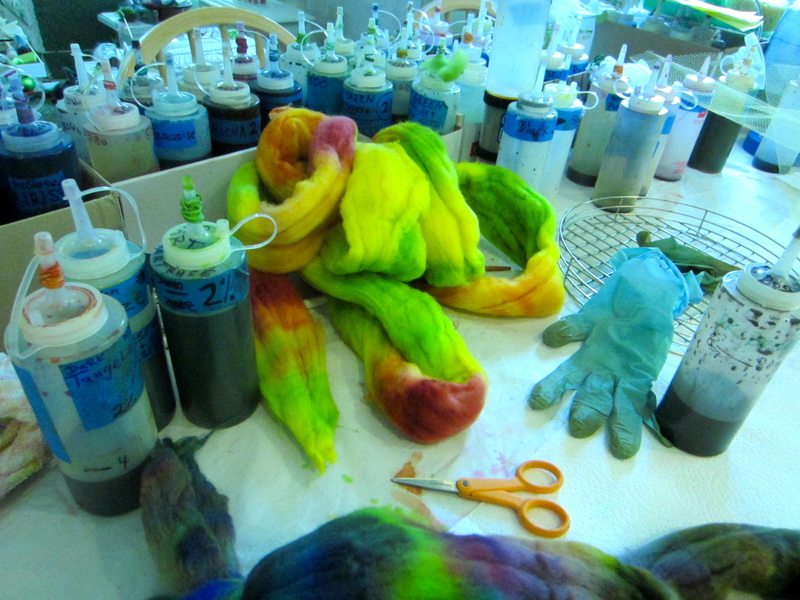 If you needle felt a nuthatch, I am in for a pairing with one of your chickadees. Went to OFFF yesterday and am regretting that I walked away from the chickadee at your booth! (Non-buyers remorse . . . ) Your work is amazing! Thank you for your compliment! 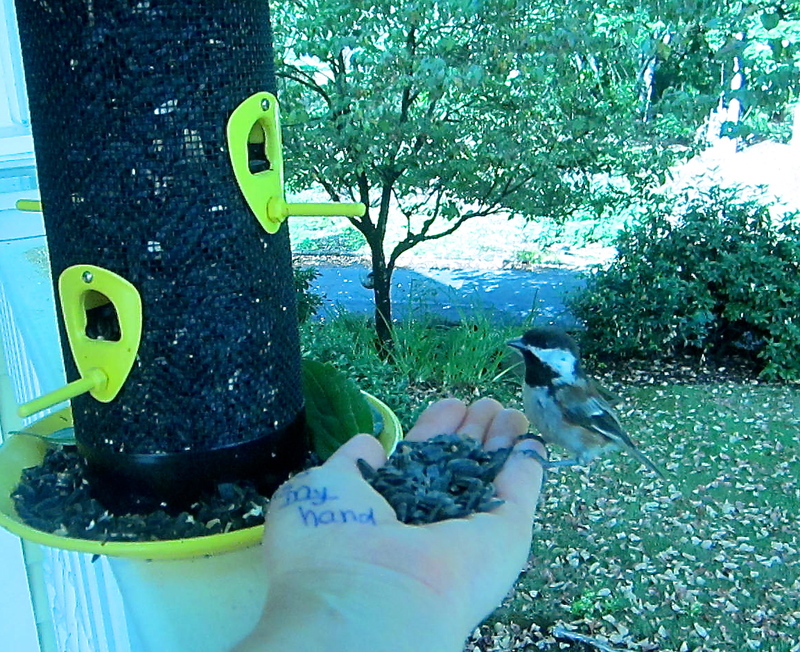 I’m glad to know you really liked the chickadee. Did you fetch a business card from our booth? If so, you can email me about your request. 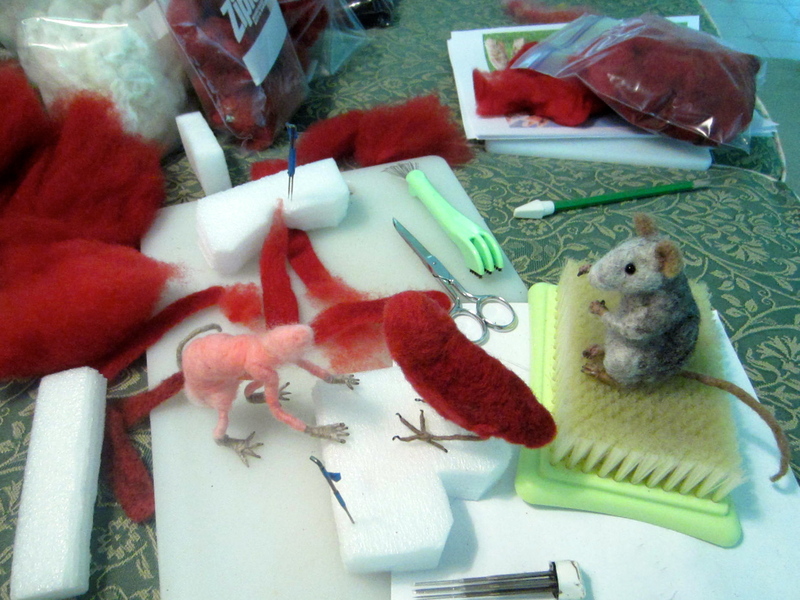 I’ve been wanting to try needle felting some nuthatches because they are such adorable little “zip-zoom” birds &amp I thought it would take time to accustom them to my presence, but no…. 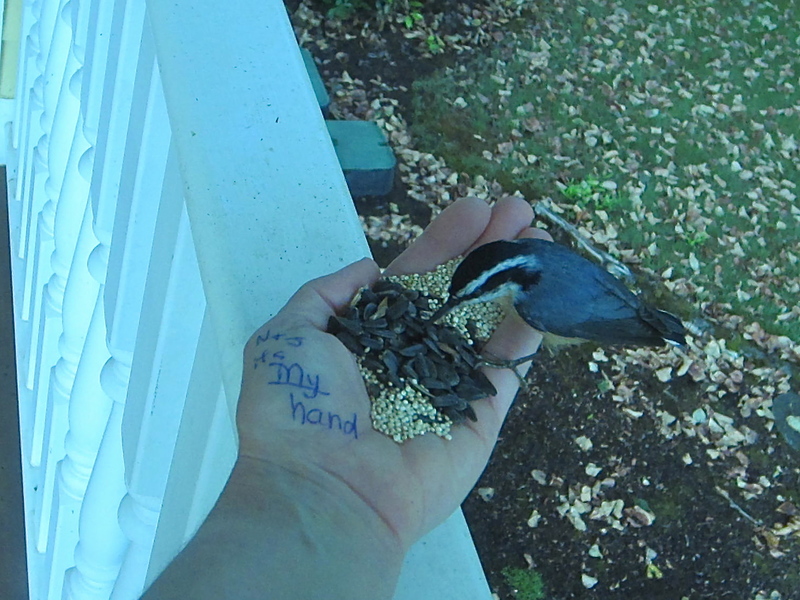 Apparently Nuthatches are SO confident of their escape-speed, they boldly landed on my hand the first day I tried it. You can probably do it too. Just position yourself comfortably next to your feeder, with seeds in hand and wait. The closer the feeder is to hand, the sooner the birds land on you. 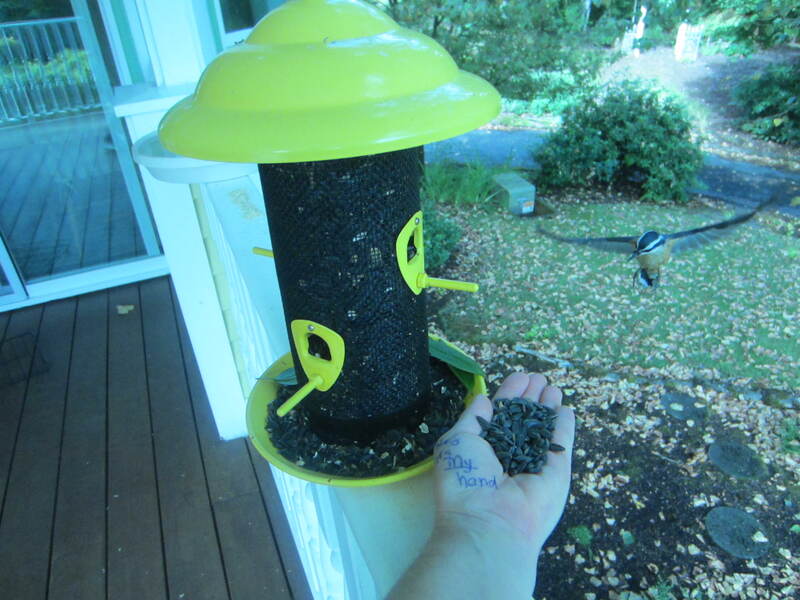 After some days setting the feeder on porch rail near my hand, I was able to hang it up nearby and they’d still come to my hand. The Chickadees are more shy, but eventually overcome it. I admit this it is somewhat an addictive pastime.